It is not simply dedication to his job that has led newspaper editor MV Kaanamyl-nathan to not leave his office for five-and-a-half years. In the spring of 2006, gunmen stormed into the building and sprayed automatic fire that killed two employees and left bullet holes in the walls and the table in the conference room that remain to this day. Since then, two police officers have been assigned to permanent duty outside the building and Mr Kaanamylnathan and his wife have left their three-bedroom home in the city and moved into a small space next to the newsroom. “I don’t go out. The only exception is to go and see my doctor, a heart-specialist, once every three months,” Mr Kaanamylnathan said. “For that, I have to make to make special arrangements. The plight of Mr Kaanamylnathan and his newspaper Uthayan, (Rising Sun in Tamil), where six members of staff have been killed in the past decade and many others attacked, threatened and harassed in incidents that continue today, is a frightening window into the world of journalism in Sri Lanka. Campaigners say reporters and media employees here are among some of the most vulnerable in the world; at least 14 have been killed in recent years and many more forced into exile. Several others are missing and unaccounted for. 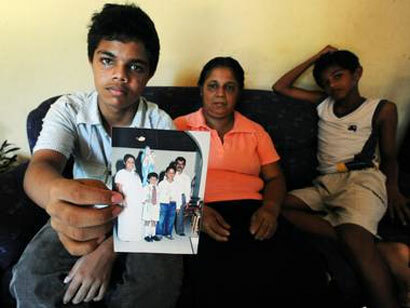 Among the most high-profile of cases was that of Lasantha Wickramatunga, editor of the often-critical Sunday Leader, who was murdered in January 2009. Nobody has yet been charged with the killing. The troubles at Uthayan, established in 1986 to appeal to working-class Tamils, did not end after police were deputed to guard the premises. A driver was killed several months later and a talented young reporter – recruited because senior correspondents declined to come to the office anymore – was shot dead the following year on his way to work. Most recently, the paper’s news editor, Gnanasundaram Kuganathan, was severely beaten by two men armed with iron bars as he left the office in July. He has since left Sri Lanka and is staying in Europe. It is unclear when he will return. “It’s a miracle that I survived. I was beaten almost to death,” he said after the attack. Mr Kaanamylnathan’s newspaper is owned by a Tamil member of parliament. While it insists its news coverage is unbiased, he does not hide the fact that the publication supports the cause of Tamil nationalism. Yet over the years, the newspaper has faced threats from the Sri Lankan military, Tamil militants and unidentified thugs allegedly linked to pro-government paramilitaries. Between 1990 and 1995, the city of Jaffna, located at the very tip of Sri Lanka, was controlled by the Liberation Tigers of Tamil Eelam (LTTE), whose decades-long insurgency for a Tamil homeland was crushed in 2009. Campaigners say President Mahinda Rajapaksa has failed to act to protect journalists and in many cases is responsible for a crackdown on dissent. Several journalists have disappeared without trace, among them Prageeth Eknaligoda, a political analyst and cartoonist from Jaffna, who was kidnapped in Colombo in January 2010, just two days before the presidential election. He worked for the LankaeNews website. The journalist’s wife, Sandya, said there had been no news about her husband and no apparent progress with the case. The police claimed they were still investigating but did not appear to be very interested, she said. She has written to everyone from the President to the country’s human rights commission but, she said,no one had offered help. More recently, the news editor of The Sunday Leader, Frederica Janz, was threatened after giving evidence in the court case of former army chief Sarath Fonseka, who was last week jailed for three years after being convicted of accusing the President’s brother of committing war crimes during the final stages of the war to defeat the LTTE. “We will not spare you,” said a handwritten note sent to her home in the capital. Campaigners say that since his re-election Mr Rajapaksa appears to be tightening his grip on dissent. In recent weeks, the government has blocked access to websites, including that of the main opposition party, the UNP. A statement issued at the time by the Ministry of Mass Media and Information said a survey it carried out had revealed that certain websites were in violation of laws designed to protect against defamation and character assassination. The moves by the government to try to control online media, a recently new development, were addressed in a report by the Centre for Policy Alternatives, an NGO based in Colombo. “The censorious attitudes towards media freedom and the freedom of expression more generally are increasingly evident in the online sphere,” it said. The minister for mass media and information, Dr Keheliya Rambukwella, could not be reached for comment, but the government has always adamantly denied any involvement in attacks on journalists. Among the goals of its national media policy is to “safeguard the right of all citizens to express their views via any and all media and to receive, provide and gather information required for the proper functioning of society”. A government-appointed body set-up to look into the civil war has reportedly concluded no state should be asked to “suspend military operations aimed at rescuing civilians forcibly held by a heavily armed terrorist group”. The Island newspaper, known to be close to the government, said the Lessons Learnt and Reconciliation Commission (LLRC) had noted that while humanitarian law prohibits the targeting of civilians, it permits com-bat operations to rescue “hostages”. The report is not yet public. A UN panel concluded there were “credible allegations” both government troops and the LTTE committed war crimes. It said tens of thousands of civilians may have died and called for an independent inquiry. The government dismissed the claims and established the LLRC. All journalists (genuine) must write responsibly and abide by ethical standards of good journalism and code of conduct. This is the law in any country. Even in the West, no journalist is allowed to incite racial hatred as it would lead to one race attacking another race or races. All countries have laws against racism and incitement of racial hatred. If there were no such laws it would lead to pogroms by one race against another. Journalists are no exception to the country’s law. Just because they are journalists it does no mean they are free to write any vile thing. They have to write responsibly according to established ethical standards and codes and the law of the land. LTTE carried out attacks on journalists and blamed the government for it. Similarly they murdered people and laid the blame on the government. It is difficult to prove who actually carried out these attacks. No State can provide security to journalists all the time. The journalists must take care to write responsibly without inciting racial hatred. In SL, we are trying to promote peace and unity as ONE NATION. ‘Uthayan’ paper promotes the opposite. It incites the Tamils to hatred against the Sinhalese majority and the Muslims and promotes Tamil autonomy for a minority. Most Tamils want peace and unity and reject Tamil nationalism. Channel 4 video, entitled “Killing Fields”, is an example of gross distortion of truth of the final days of the Humanitarian Operation to rescue the 300,000 plus Tamil hostages held as a human shield by the LTTE of its own people who they were supposed to be fighting for, for eelam. LTTE committed a war crime thereby besides their multitude of other war crimes and crimes against humanity. The LTTE were totally eradicated. Unable to bare the shame of it, the diaspora LTTE/Tamils concocted a video presentation of so-called war crimes of the SL army. They paid £5,000,000 to Channel 4, for repeat televising of this documentary, which was proven to be a gross distortion of truth. By showing it also through media of Western countries they earned a huge income. This is irresponsible journalism. The imperial West aids and abets the LTTE, a proscribed terrorist group in their own countries, because the UPFA government of SL did not halt the war of humanitarian operation to rescue the Tamil hostages, at US bidding. Now this very same media is propagating the myth of no media freedom in SL. There is no media freedom in the West either to publish reports that break the law of the land. Journalists have to write responsibly abiding by ethical standards of journalism and the law of the land. Media freedom does not mean they can write any rubbish to promote racial hatred. If such media does not abide by the law of the land they must suffer the consequences, as in the West. Isn’t it high time that the editor/owner of Uthayan newspaper, Mr Kaanamylnathan, is investigated impartially for breach of SL law by incitement of racial hatred through its columns and racial disharmony? If evidence is found, isn’t it time he is charged with the crime? If found guilty by a Trial-at-Bar he deserves an appropriate sentence and the paper shut down. The truth will then be revealed to the world. Nicholas Dias, the erudite blogger, is the conscience of the Nation. He is the lead to all bloggers in Onlanka. He is our God given gift, our inspiration and our source of wisdom. God has assigned him a role; and Nicholas performs that leadership role with care and dilligence. I hardly ever agree with what he says in his blogs but he remains a venerable figure. In fact, I am obsessed with his responses and his thoughts pervade mine, day in, day out. Nicholas is my hero. His thoughts and words are etched in granite in this hour darkness and shall remain so for eons. Thanks for your lovely compliment and defence of my good name. This shows you are a good man. God bless you always and care for you and grant you eternal happiness! I lived in Bangalore, Andra Pradesh, Kerala and Madras for 6 years as a Franciscan student monk, from 1961-1967. I led a life of prayer and meditation. I studied Philosophy and Theology among other subjects. I cared for the poor and the destitute and even Tamil refugees from Burma. We are on opposite camps but fighting for justice. I pray to God that SL remain ONE NATION ONE COUNTRY and not a pawn of the imperial West to exploit us. When I was a teacher at St Peter’s Colombo-4, I gave free tution to a poor Tamil boy in several subjects, visiting him at home every Sunday. I hope he is doing well today. I had no racial prejudice. I saw him only as a child of God. We should all try to live according to our conscience, whatever our religion. We should respect all religions. No religion teaches us to do evil. Only evil men teach and commit evil. Their lives are short. They play fast and lose. Such men are in living hell within themselves, even though they may be in the lap of luxury from the wealth they have gained from their crimes. They are never at peace. When they die they will be in hell forever. Hell means, being one with the ‘evil one’, the devil. Peace and joy comes only from being morally upright. Such people, grow in the image of God (imago Dei) and gain union with God, even though they may not believe in God. What is this image of God? Growing in the image of God means, as God is good being good, as God is loving being loving, as God is forgiving being forgiving etc. Such people have eternal peace and joy within their soul. They are in union with God. They are in God and God in them. They are actually in heaven already on earth, even though they may be physically poor and ill. For being one with God is being in heaven. God is heaven. They are truly children of God. When they die they will merit eternal peace and joy, when they become ultimately one with God forever. This is my simple philosophy/theology. I believe in this and try to live accordingly helping my fellow men and caring for the environment God created. When I was a Franciscan student monk in Bangalore, one night after 7pm supper, as we were making our way along a long dark corridor in pairs to the chapel to say our night prayers (Compline), chanting a psalm in Latin as we walked, I switched on the light in the middle as I was at the head of the procession. God spoke to me in that instance to warn me. God said, “Switch on the light at the end of the corridor from a distance and jump back, as there is a cobra there”. I did exactly as God instructed. Sure enough there was a cobra. Another monk killed the cobra with a broom. When God spoke to me, He did so not by auditory voice, but by downloading the whole concept into my mind in a nanosec. It was amazing! I realised then God truly exists and cares for us. I also realised God does not need a language to speak to us but speaks by enlightening our mind with whole concepts in a nanosec, like downloading into a computer. I hope you lead a righteous life. I promise you then, eternal life in heaven, which begins here and now on earth itself. This is true for everyone who live according to their conscience, whether they believe in God or not.